Republican National Committee Co-Chair Bob Paduchik encourages Gallia Republicans to vote in the coming November election. 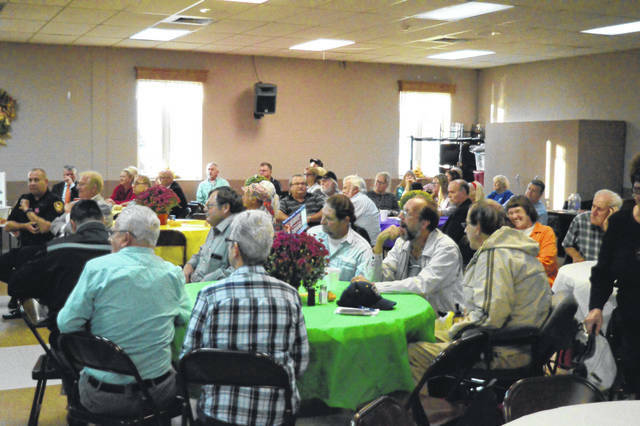 Gallia Republicans gather for food and fellowship. 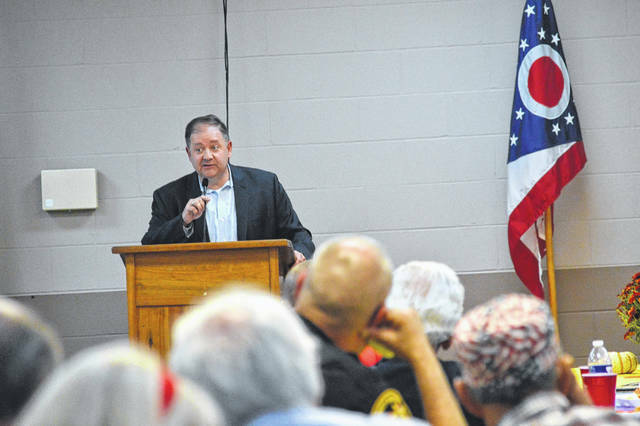 GALLIPOLIS — Gallia Republicans gathered for their Fall Rally Thursday evening at the Gallia Senior Center and hosted Republican guests from near and far with Republican National Committee Co-Chair Bob Paduchik serving as the evening’s keynote speaker. Gallia Commissioner candidate and incumbent Harold Montgomery shared a few words with visitors before US Congressman Bill Johnson, of Ohio’s sixth congressional district, introduced Paduchik. Montgomery’s democratic opponent for commissioner is Randy Adkins, Morgan Township Trustee. “I’m honored to be here this evening in a room full of Republicans,” said Montgomery. “Thanks for the folks in DC for having the wisdom to appoint (US Supreme Court Justice Brett) Kavanaugh. I’m running for commissioner this year and I do have a contested race. I have served Gallia County for 20 years as a commissioner…I appreciate your vote and electing me as commissioner. I do my utmost to serve the county. Paduchik shared a story of his first introduction to Trump while preparing a rally in Saint Clairsville, which was also Johnson’s first introduction to then candidate Trump. With pre-rally jitters and moving to overcome logistical event challenges, Paduchik said he received a phone call saying that Trump would be arriving an hour earlier. Johnson had also arrived that day so Paduchik said he would meet with the congressman in the green room of the event venue. The RNC co-chair said at that point in time he still did not know when candidate Trump would be arriving, save for he knew it would be an hour early. In the room was Trump. Paduchik said Trump had been engaged in conversation for nearly twenty minutes or a half an hour with the congressman. Paduchik said the moment “blew him away” and was the most “gracious” anyone had treated him as a staff person on a campaign. Paduchik said he felt Trump had succeeded more in many of his campaign promises in his first two years in office than presidents of recent memory. He credited Trump will filling federal appellate courts with judges and that he was making America safer. Paduchik said Republicans were the party of the blue collar American. He urged voters to make certain Republicans came out on top in the midterm elections. He voiced concern for democrat behavior during the recent judiciary hearings with now US Supreme Court Justice Brett Kavanaugh. Candidates for Ohio Judges of Court of Appeals Jason Smith and Mike Hess asked Gallia for its support and Gallia Prosecutor Jason Holdren urged Gallia voters to stand against Issue One.